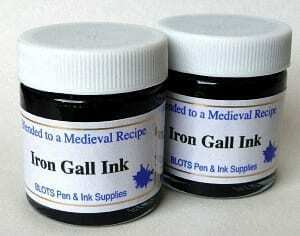 Iron Gall ink is probably the most important ink in the western world. It gives superb hairlines and dries to a velvety blue-black. Iron-gall ink was the most important ink in Western history. Rembrandt and Van Gogh drew with it. Carbon inks were the first writing inks and are found on ancient scrolls as early as 2500 BC. Unlike paper, parchment was not absorbent, so carbon-based ink easily rubbed away. 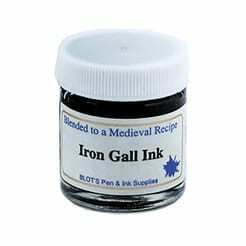 Iron-gall ink was very useful because it ate into the parchment and did not rub off documents. 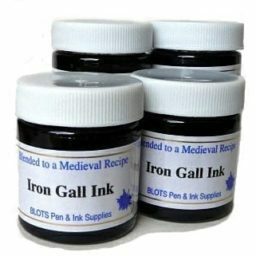 Blot’s Iron Gall Ink is carefully prepared with reference to Palatino’s recipe of AD1540 and is a rare opportunity to experience this medieval ink. 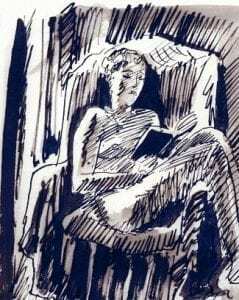 Natasha was drawn by Malcolm Pollard with one of his own reed pens (Zenpens) using Blots Iron Gall Ink. Unfortunately Malcolm died and his beautiful, unique, reed pens are no longer being made. Iron Gall Ink dries to a velvety blue/black but also visible in the sketch are sepia tones which are probably a result of undissolved iron in the ink. Blots Iron Gall Ink is highly valued for its unique characteristics and distinctive finish in sketching and writing. The picture is constrained by the limitations of scanning and transmission.